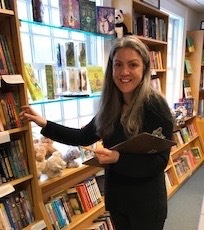 Brenna Bellavance, an avid reader, is our newest bookseller. Clever is the word. Sharp would work, too. Capin’s reimagining of the story of Henry VIII and his wives is both of those things, on a number of levels. Sure, the dialog is snappy, but that’s really just the icing. The real triumph here is in the very real portrait of a culture that hasn’t actually changed all that much. One can’t, of course, easily get away with having an ex beheaded, but a smart, handsome football hero has other tools in his arsenal, least of which being an insidious cultural double standard. Fortunately, “Cleves,” and Henry’s other ex-girlfriends- the ones that survive it anyhow- have a few tools of their own. Fun and somewhat more satisfying than history. Despite the beautiful writing, I wasn’t sure I was going to like Little Culinary Triumphs. The novel quickly introduces a number of unlikeable and myopic characters. Had I not been trapped on an airplane with no other book, I might well have given up. I’m so glad I didn’t. It shouldn’t have worked- these characters don’t grow because they see the errors in their selfish ways, but rather because they each act as foil to the other’s selfish plans. What promises to be a snapshot of human apathy somehow becomes exactly the opposite, and it is delightful. Kate Morton can simply be depended upon to tell a good story. A likeable heroine, a little bit of history, a little bit of mystery, a little bit of romance, and a couple of interwoven timelines….a story to lose yourself, and the surrounding chaos of the real world, for a little while. This is a wonderfully creepy book. Set in a small town in rural Vermont, Arden is such a gifted storyteller, and creates a sensory experience. I fell into the story like Alice down a hole. A hole in a cornfield maze, and surrounded by come-to-life scarecrows bent on my destruction. For anyone who wants a really good ghost story. Imagine Elmore Leonard, hopped up on LSD, locked in a room with a sarcastic tween girl and a fifty-pound bag of Skittles. Add 30 years of pop-culture and a schizophrenic thesaurus. Dangerously clever and childishly sleazy, you’re going to want to brace yourself and hang on for dear life- this isn’t going anyplace you’ve been before. Fantastically fun and original, our title character- an artist and umbrella-maker- travels through five genres: heist mystery, spy thriller, gothic horror, space opera, and fantasy- all set in a fabulously surreal island mansion. Reminiscent of the old “Choose your own adventure” books, but much, much better. Ndaba Mandela lived in the ghetto until he was 10, when his grandfather, Nelson Mandela, was released from prison. This is not just the story of a boy learning to be a man, it’s the story of a boy learning to take on the mantle of responsibility, the labor of love, that was his grandfather’s legacy. A potent glimpse of the ongoing aftermath of apartheid. When you just can't take one more terrible news story, Dear Mrs. Bird is the solution. Living in London during the Blitz, impulsive and determinedly cheerful Emmy dreams of being a war correspondent, but ends up as a letter reader for a dour and repressive advice columnist. Instructed to destroy all letters deemed unpleasant, Emmy instead begins responding to them. A charming, if temporary, respite from our current reality. Livy was only five the last time she visited her grandmother in Australia, so when she returns five years later, with very little memory of her earlier visit, her lack of recall doesn't seem that odd at first. Until she opens the closet, and finds Bob, a small green being dressed in a homemade chicken suit, who has been waiting patiently for her to return as promised. Sweet, silly, and wholly original. Elsie is not a real person. From the moment she came to exist, she has been told this repeatedly. She is merely the physical embodiment of an unwanted memory extracted from another woman, a real woman, whose face she sees every time she looks in a mirror. Except that she remembers a life she didn’t live, loves people she never met, thinks her own thoughts, and feels her own feelings. So what makes a real person….real? Exquisite and haunting, Mem has stayed with me. This book was everything I would have wanted from a story when I was eleven, and everything I want from a story that I would put it into the hands of an eleven-year-old now. Adventure, ciphers, a little history, and a kind of magic you don’t have to believe in to be marvelous, make it so much fun to read. Ruby’s multicultural cast of characters bring the story to life, but it’s her light hand with issues like racism, sexism, greed, and philanthropy that is so impressive. These issues are simply part of the story and they give weight to this fantastic adventure, all while encouraging young readers to come to the right conclusions on their own. I think the mark of a true genius lies not in one’s ability to understand complex and difficult ideas, but in the ability to explain them, simply, to those of us that don’t speak the language. Rovelli not only manages this, but does it with such eloquence and grace that bending one’s brain to revisit how we perceive time becomes something less an agony and more a genuine pleasure. Physics as translated through poetry. My only regret is reading it before the audiobook narration done by Benedict Cumberbatch was released- though with a book like this, I’ll happily do it all over again. Until Tom Barren screws it up, his 2016 looks very different from the one we live in now. Free from war, disease, poverty, pollution - it’s the idealized future we dreamt of in the fifties - all come to pass. But in the moment time travel comes to exist, screw it up is precisely what he does, and the next thing he knows, he finds himself in our world. Funny, sharp, and very human, All Our Wrong Todays is aggressively readable, incredibly relatable, and hugely satisfying. In April of 1962, the Kennedys hosted a White House dinner for some of the greatest scientists, thinkers, and writers of the time. In this very entertaining book, Esposito paints a richly detailed portrait of the night. His extensive research really makes this evening come alive: the journeys the guests take to get to DC, their personal and professional backgrounds that illustrate their lives, and the relevance of position within the social and political climate of that moment. That said, it is perhaps Esposito’s restraint that makes it so readable. While it made me want to read a dozen different biographies, he didn’t attempt to include them all here, and instead illustrates beautifully one moment in time with a light, but fascinating touch. I absolutely adored Mr. Penumbra’s 24-hour-Bookstore, and Slone’s second novel, Sourdough, is no less charming or quirky, and treats food (sourdough bread, specifically) with the same reverential love he showed books in the first. Lois’s life as a robotics engineer seems quietly fine until a spicy sandwich on homemade sourdough bread upends her placid existence and the next thing you know, she’s building a brick oven in her backyard, trying to discern the musical tastes of her sourdough starter, and upsetting the status quo in the cafeteria at her work. Sloane creates a sort of low-key magic- just surreal enough to be charming, just real enough to make the surreal elements easily palatable. Sourdough is fun and disarming- a great way to spend a Sunday afternoon. Sharp and spare, Ursula Le Guin has a gift for saying precisely what she means in as few words as possible…before she turns around and does exactly the opposite: using two pages of somehow both gracious and biting prose to make a point not entirely clear until the very last paragraph. Funny, insightful, and very human, Le Guin’s voice in these bite-sized essays- which run the range from her thoughts on aging, exorcism, and the baffling behavior of her cat - is so entirely her own. I was left feeling as though I’d known her forever, as though she were the marvelous and slightly terrifying aunt I never knew I always wanted. I can’t think of a novel I’ve enjoyed so completely in a long time. Heller writes beautifully. His characters are wonderful and multi-dimensional, and the story is intriguing and well-plotted. Part mystery, part family saga, part on-the-road adventure and all expressed in a lyrical prose that made this a treat to read. I found myself re-reading sentences, even paragraphs, repeatedly in the way I might re-play a song I particularly liked, in an attempt to understand precisely where the magic lay. In short, reading Celine was a pure pleasure. A little dark, a little surreal and completely unpredictable, The Readymade Thief grabbed my attention early and kept me off-balance the entire time. Seventeen-year-old Lee goes from being largely invisible in a life that barely cares for her to being hunted by sinister and mysterious characters. She can’t begin to fathom her predicament. Befriended by a young artist/hacker, Lee goes on a frantic run for her life, never knowing who she can trust, where or if she’ll be safe long enough to sleep, or when these shadowy threats will appear. A memoir about a life plagued by depression, anxiety, and a whole host of related disorders shouldn’t be screamingly funny. And yet, I read Furiously Happy in one sitting, started laughing on page two, and laughed so hard I cried more than once. Her love of taxidermied animals (but only the ones that have died of natural causes) in costumes alone is enough to have you in stitches. For anyone who has dealt with anxiety, depression, OCD, or really, any other strange or paralyzing mental health disorder- be it your own, or the baffling misery of someone in your life- this is a MUST READ. Jenny Lawson will change your perspective on all of it, and it might be the most fun you’ve ever had with your nose in a book. When his whole world has been covered in floodwaters, eleven-year-old Malcolm, captain of his trusty canoe, La Belle Sauvage, becomes chief protector of infant Lyra as dark forces (partially in the form of a terrifying hyena) descend to harm her. Aided only by an unlikely ally, a dour sixteen-year-old dishwasher, Alice, he must get the baby to sanctuary. Pullman brings the reader along through a world rendered unfamiliar and terrifying, not just by the overwhelming sea, but by the surreal, fairytale-like existence that keeps blending with Malcolm’s reality. The vivid, unpredictable nature of the story-telling rendered me helpless to do anything but be thrashed about in that little canoe with them, begging for relief, and terrified I’d get there too soon. Part fairytale, part social commentary, all artfully wrapped in a heart-thudding adventure story, it would be a shame to miss this simply because it wasn’t necessarily written for adults.